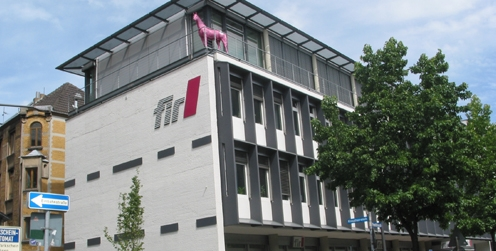 The summer school will take place at Forschungsinstitut für Rationalisierung (FIR), Pontdriesch 14/16, 52062 Aachen, Germany. Aachen is the westernmost city of Germany, located along its borders with Belgium and the Netherlands, 65 km west of Cologne. • the FIR building is located at the end of the street on the right. Please contact the information desk. • the entrance to the parking garage “Großkölnstraße” is another 20 m on your righthand-side. By train via “Köln Hauptbahnhof” (main station) to “Aachen Hauptbahnhof” (main station). By train to “Aachen Hauptbahnhof” (main station). By the Interliner 420 or 421 (bus) direction Aachen to “Aachen Hauptbahnhof” (main station). By Airport City Express (train) to station “Brüssel-Mitte” or “Brüssel-Nord”. From there via Lüttich to “Aachen Hauptbahnhof” (main station). Aachen is linked to the international railway network. Every two hours, the high-speed train THALYS operates via Aachen between Paris and Cologne. Besides ICE trains rum from Frankfurt to Brussels via Aachen. There are direct connections to the cities of Cologne, Düsseldorf, Dortmund, Siegen, Frankfurt/Main and Hamm. An hourly connection to Heerlen links Aachen to the Dutch railway system. By bus to destination bus stop “Driescher Gässchen” or “Ponttor”. By bus to destination bus stop “Driescher Gässchen” or “Ponttor”. Or 10 minutes to walk. Less than 1 minute to walk. Aachen was a favoured residence of Charlemagne, and the place of coronation of the Kings of Germany. Aachen predominate economic focus is on science, information technology and related sectors. For innovation, Aachen has been ranked 42nd globally out of 256 cities, and 8th in Germany. Aachen has the hottest springs of Central Europe with water temperatures of 74°C(165°F).